Description: Intermodals detouring on the Grenada District meet in Winona. Description: New look on the railroad. All that's left of the Illinois Central are the small white letters above the front truck. Description: IC 6140 is the last unit on the daily Auto rack and auto parts train (271). It is passing South Mattoon. Description: CN 5279 and its fellow IC engines get ready to pull the commercials out of the yard , and back to the train. 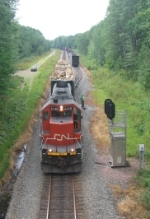 Description: About 15 minutes later, I catch this CN auto carrier coming off the IC line headed east. Number 8. Description: Two different rear number boards on this ex-IC SD40-2. Description: The 6140 and the 7042 were about to back down into the yard and begin switching. Description: The third unit is the Minnesota Transportation Museum's ex-BN SD9 #6234, freshly painted in Horicon, WI.